To start this one I was actually inspired during my Abrams build. When working on this kit, I have spend quite some time weathering the upper hull, just to see it being hidden by the huge turret. So I thought it would be nice to have a model, where this could actually show. Being big fan of Israeli armour I thought this model might be just right to do that. What to say about this kit. It’s Hobby Boss and it uses similar parts and construction principles as their Merkava IV kit. 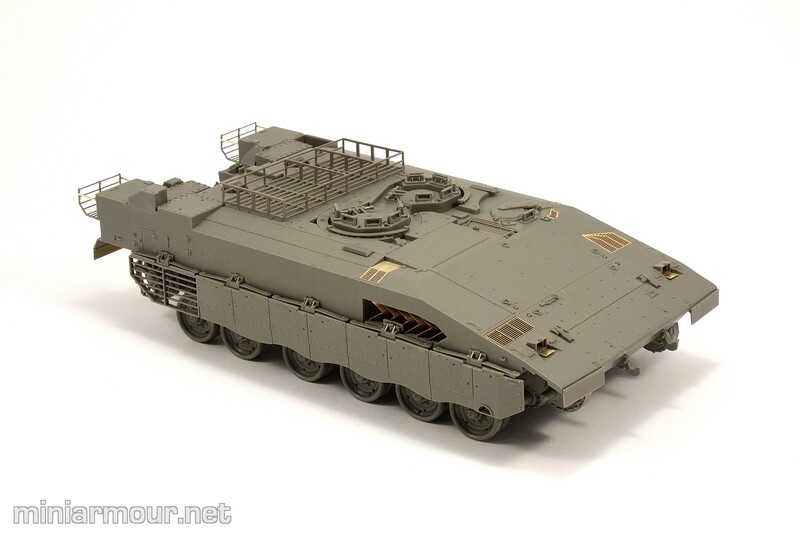 Unlike Merkava IV the parts are cast in darker grey colour (perhaps close to actual colour of the vehicle?). Construction of the model was so far rather straightfoward. Upper hull has nice anti slip texture and details around the crew hatches. Missing turret gives this vehicle interesting shape and I am looking forward to paint and weather this piece. Side skirts are nicely done and add to the unique look of the tank. I have only attached them temporarily with super glue and will remove them and the wheels for painting (unfortunately I don’t think you could take the wheels off and put them back on with the skirts attached, which would make the painting much easier). The kit was criticized since there is only prototype of this vehicle, i.e. it is not a production version. Crane assembly is apparently simplified, which I can confirm just by looking at the parts, but I haven’t got to that part of the assembly yet. In any case it is so far looking good, hopefully not a lot of work to finish construction and put the airbrush to work.